Salman Abedi (inset) killed 22 people and injured at least 119 more when he detonated a bomb at Manchester Arena on Monday night as children were piling out of the venue having watched Ariana Grande. But this afternoon the father of the attacker, Ramadan Abedi (right), said: 'We don't believe in killing innocents. This is not us. Lounging on the beach in Libya with friends and hanging out with his mates in Manchester, this is Salman Abedi (circled) as a teenage boy before he became a suicide bomber. There is a no suggestion any of the friends he is pictured with have been involved in any wrong doing. He said he had spoken to his 22-year-old son five days ago and that he sounded 'normal' and was getting ready to visit Saudi Arabia. Earlier, pictures emerged showing Abedi lounging on the beach in Libya with friends and hanging out with his mates in Manchester as a teenager. There is no suggestion any of the people he was pictured with have been involved in any wrongdoing. His father, Ramadan, was arrested by masked gunmen in Tripoli this evening while recording TV interviews in the country. Earlier he had claimed his son seemed 'normal' when they last spoke five days ago and insisted: 'We don't believe in killing innocents. 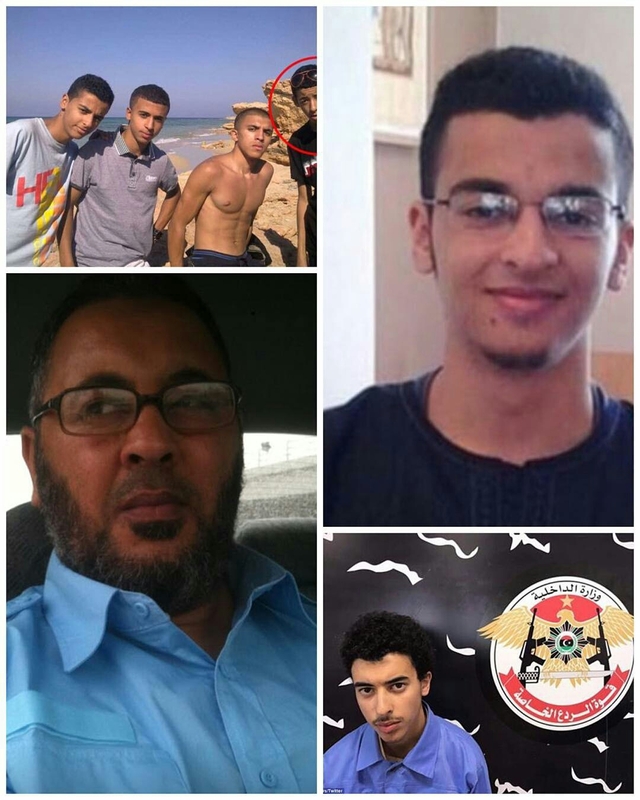 Abedi's younger brother Hashem has also been arrested in Tripoli, Libya, on suspicion of having links to the ISIS who claimed responsibility for Monday night's atrocity. He was 'aware of all the details' of his plans, a Libyan security force said. Hashem had been 'under surveillance for a month and a half' and 'investigation teams supplied intelligence that he was planning a terrorist attack in the capital Tripoli', the Deterrence Force said on its Facebook page. Salman's older brother Ismail, 23, was arrested yesterday in Chorlton, south Manchester. He is still being quizzed by police, who are probing the family's links to a terror network. 0 Comment to "Manchester bomber's father and brothers have been arrested (photos)"